The New England Women's Convention will be back on May 9-10, 2019! Calling all YNG guys! A night to get away and have some fun together! 2 hours of camaraderie and seeing who really knows how to bowl. Spots are limited. Registration required. Get ready for a great adventure! June 10-17, 2019 we are heading to San Pedro Sula, Honduras for a week of ministry, loving on others and fun. We are partnering with our friends at the Grace Dream Center to minister to the hurting and hopeless of Honduras. Street campaigns, orphanages, villages, local outreaches and services at City Hope Church Honduras are all on the agenda. With some local shopping and fun thrown in of course! Honduras is hurting. It is a country full of people who need hope, purpose and destiny. We have the incredible opportunity of being Jesus to a beautiful people. This is not a trip you want to miss! Serve Day is an annual national campaign of churches that dedicate the second Saturday in July to make a difference in their local communities. International Family Church is looking forward to joining forces with this national coalition this year on July 13th. Spend an evening with IFC's finest: our Dream Teamers! Pastors Jonathan and Verna want YOU to spend an evening connecting with Team IFC! Join us for food, games, surprises and and inspiring message from our Pastors! Doors open at 7:00 p.m. Here at IFC we believe that you discover your God-given purpose by developing your talents and gifts. Every week our singers and musicians have the opportunity to lead worship in our main service, for our kids and students in Kid’s World and IFC Youth, and our Young Adults at YNG…And, we want to extend that same opportunity to you! Whether you have experience on a worship team, have played in a band, or just enjoy singing and playing your instrument; there are a variety of ways that talented singers and musicians can use their gifts here at IFC. On March 2nd and 3rd we’ll be holding open auditions for all singers and musicians. We’re looking for heart, passion for Jesus, good attitude, and a desire to improve their musical gift. You can sign up today in The Hub or on the events page at intlfamilychurch.com! We look forward to meeting you on March 2nd and March 3rd. Coming up on February 8th to 10th is IFC Youth’s Winter Camp at Camp Brookwoods in Alton Bay, NH. This is a weekend that your student won’t want to miss. Not only will there be fun outdoor winter activities and games but your student will have the opportunity to be away from their normal routine and encounter God in a real meaningful way. We know it will be a life changing weekend for your student as they meet new friends, get to be a part of small groups and have tons of fun. Space is limited so you don’t want to wait for the last minute to register. If you have an interest, want to learn about a topic or just get a group of people together around a fun activity then you are free to lead a Life Group. Come to the Life Group Leader Orientation on Sunday February 3rd in the Cafe on the 2nd floor. YOUR MARRIAGE IS MEANT FOR MORE! God made marriage for a reason. He didn’t design it for lonely roommates, uninspired co-parents, or bored financial partners. He created marriage to give us life. This amazing gi reflects His love for us—and that love is extraordinary! At XO, transform your relationship into the thriving marriage He wants you to enjoy. Join us on December 24th for a traditional Christmas Eve Candlelight service as we celebrate the birth of our savior. Childcare will be available for Nursery and Preschool only. If you’ve never been baptized, or you have a child that is ready to make that public commitment to Christ, we have an opportunity for you coming up on Sunday December 16th. We’ll be having a water baptism as part of our worship service in the sanctuary during service. It’ll be a very special experience and something you’ll want to experience with family and friends. We have a very special service coming up on Friday, December 7th at 7:30 PM with friend of IFC, Dr. Mary Frances Varallo. Dr Varallo has travelled the world for over 30 years ministering with a strong prophetic gift. God has used her to move in the miraculous and minister a message of destiny. It will be well worth your time to come out on a Friday night and experience the ministry of Dr. Varallo. Parents, we’ll have Full Kids World available for your kids that night as well. Matthew Barnett, Best-Selling Author of The Church That Never Sleeps and The Cause Within You and pastor of one of America’s fasting growing churches, is one of the most dynamic voices God is using in Christianity today. During the Red Sox/Dodgers World Series this year, Pastor Jonathan made a friendly bet with Pastor Matthew that whoever’s team won the other person would have to preach at the winner’s church wearing the other’s team jersey! Pastor Matthew, a Dodgers fan since he moved to LA in the 1990’s, will be wearing a Red Sox jersey at IFC. We’re going to help him celebrate by wearing Red Sox gear too to help him celebrate our victorious Red Sox! If you’re between the ages of 18-35, we invite you to join us for YNG’s annual Fall Retreat in Greenfield, NH! It’s going to be a time of worship, small groups, guest speakers, and so much more! Space is limited, so don’t wait to sign up! Come see us in The Hub in the lobby after service on Sunday to save your spot. If you serve on a Dream Team or are interested in using your gifts and talents to make a difference then join us for Team Night on October 19th. It’s a great opportunity to connect with other Dream Team members and hear vision from our Pastors. Get your New England football gear on and celebrate our Dream Teams with a tail gate party to start the night off. You won’t want to miss it! On Friday, September 21st at 7:00 PM we are having our very first Kids World Parent Night. Join us for an engaging evening where you can connect with other parents, your child’s teachers and learn about the stage of life your child is at to help you navigate this new school year. Light refreshments will be served. We can’t wait to see you there! P.S. This is a Parent/Guardian event only! Grab your lawn chairs, snacks and blankets, and join us with the whole family on Wednesday, August 8th at 8:00PM for a free family-friendly movie. We believe that generosity speaks and has the ability to change lives. We have the opportunity this month to partner with an organization in Lawrence, MA called Olive in July. Olive in July was founded by IFC partners and is dedicated to connecting low-income families and disabled children with local resources. 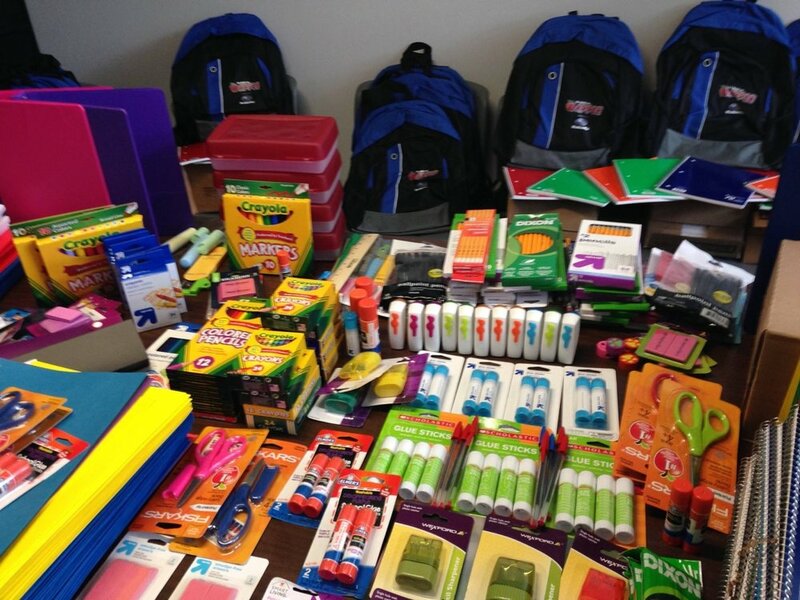 We are joining forces with Olive in July to provide over 200 students with back packs full of school supplies. We’ve gone ahead and purchased all of the back packs. You can get involved by helping us purchase requested school supplies and bringing them to The Hub. Together we’ll fill all the back packs and help these students get ready to go back to school. Join us in helping Olive in July make a difference in the lives of children in our surrounding communities. You asked, we answered...YNG Prom is BACK! Grab your dancing shoes, your friends, and get ready for the time of your life! DJ. Great food. Prizes. Crowning of the Prom King and Queen. Space is limited, so don't wait to register. Childcare is available but limited. Cost is $10 per child for the evening with a family (siblings) cap of $20. E-mail us with your children's names and ages to reserve your spot. We will contact you with payment options. Please visit www.theleadconference.com for more information. We’re so excited to be a host church for Marriage Today’s XO Marriage Conference on February 16th and 17th. No matter where you are on the journey of marriage, God desires for you to have the best marriage possible. The XO Marriage Conference will help you make a good marriage great and will help set a struggling marriage back on the path to success. Email us to be placed on the waitlist. Join us weekday afternoons from 12:00 - 1:00 PM at IFC in the Cafe during the 21 Days of Prayer for morning prayer! Join us Fridays from 7:30 - 8:30 PM at IFC in the Main Auditorium during the 21 Days of Prayer for Church-wide corporate prayer! Join us weekday mornings from 6:00 - 7:00 AM at IFC in the Cafe during the 21 Days of Prayer for morning prayer!